Christmas baking is my absolute favorite kind of baking! I love giving cookies as gifts, sharing them with family, and having an excuse to eat sweets for breakfast. Today I am sharing one of the easiest and best recipes my mom makes: chocolate covered shortbread. They are so easy and so delicious! - Combine butter, sugar, salt, and flour in a large bowl. Mix completely on medium in a stand mixer or with a hand mixer. - Roll dough into individual sticks. - Place cookies on cookie sheet and put in refrigerator for 2 hours until hardened. - Preheat oven to 325 degrees and bake for 12 to 15 minutes. - Melt your chocolate and Crisco together in the microwave on medium until smooth. Check it and stir every 30 seconds. - Dip shortbread cookies halfway into chocolate and place back on cookie sheet. - Decorate with festive sprinkles and refrigerate until chocolate is hard. Linking up today for Tuesday's Recipe Swap with Kate and Emily! I love shortbread! It's so good and addicting haha. See those look easy but with my luck they'd turn out horrible. I seem to be able to make anything except for sugar type cookies. It just doesn't happen! Christmas time, cookies taste even better!!! Really cute idea for holiday entertaining! Those look delicious, lady! new follower! These are so cute! 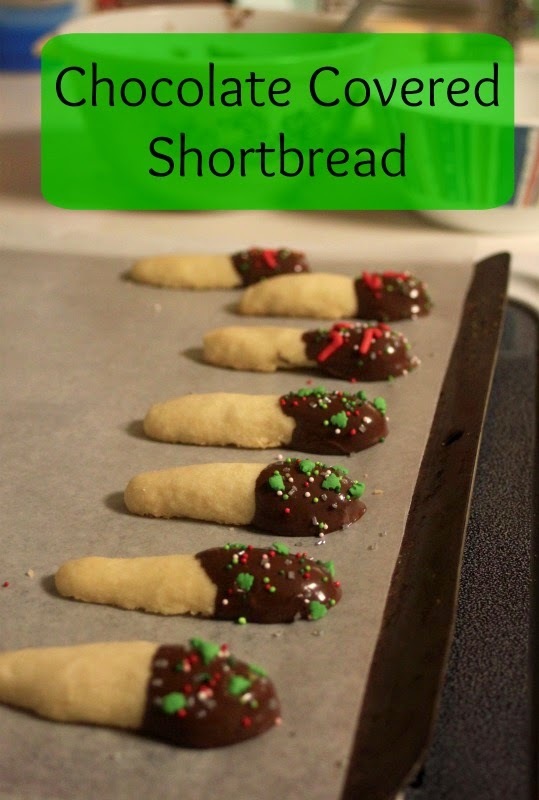 I do a similar thing with sugar cookies, dip half of them in chocolate and then do either crushed peppermint or sprinkles on top of the chocolate - so delicious! I love shortbread cookies. They look so yummy and festive! Yum! I love shortbread cookies but when you mix them with chocolate I'm sold. I baked up 2 pumpkin pies today. The house smells awesome! I'll take any excuse to eat cookies for breakfast ;) These sound so good - we're doing our holiday baking this weekend and I think I need to add these babies to the list!